Retired Illinois State Police Master Sgt. Diane Vanderkooy is truly a trailblazer within Special Olympics. 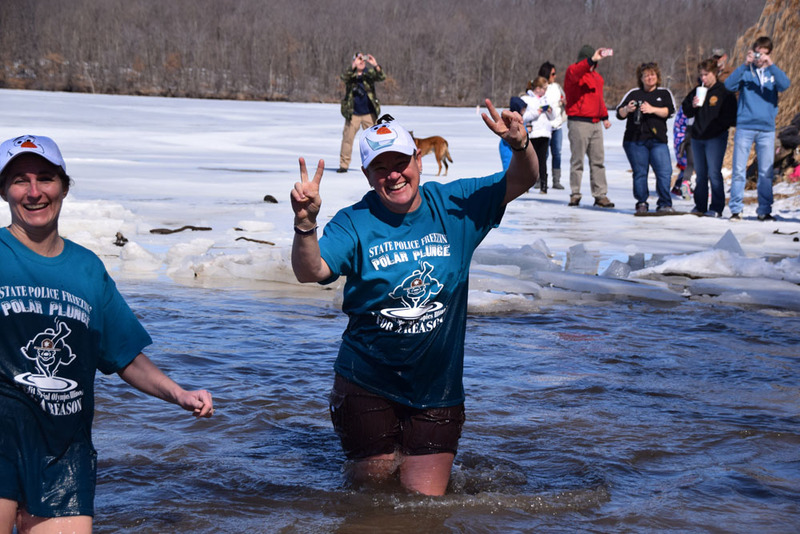 From handing out medals at Spring Games to raising money for the Law Enforcement Torch Run to jumping into Lake Springfield for the Polar Plunge, Vanderkooy shines at every event. The Illinois State Police (ISP) became involved with the Springfield Polar Plunge in 2003. The ISP has 22 districts in Illinois and troopers participate in local Plunges throughout the state. Vanderkooy’s team usually ranges from 10 – 30 members. In 2014, the team had more than 30 members participate in the Plunge. She is hoping the same amount plunge this year. In addition to the troopers who plunge, former students of Vanderkooy also take the chilly dip. Vanderkooy coached volleyball and softball at Little Flower where her students plunged with her and have continued the tradition into college. “I am thrilled that even this year some have gone away to college and will come back to plunge with me again,” says Vanderkooy. 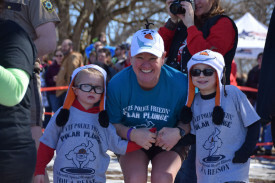 Other Springfield schools that join her at the Plunge include Springfield High School, Illinois College, Blackburn College, Blessed Sacrament and University of Illinois at Springfield. A unique thing about Vanderkooy’s team is the costumes. Instead of wearing a head-to-toe costume, she makes 30 “Freezing for a Reason” T-shirts and a themed hat. The team has worn “Cat in the Hat,” Olaf from “Frozen,” “Minions” and LETR hats with a bouncy heart on them. This year’s theme has not been decided yet. “My grandkids have been shooting me some ideas that are promising,” says Vanderkooy. Vanderkooy uses her relationships with her friends, family and co-workers to fundraise as well as her own Plunge fundraising website. She spreads the word with her church family where they donate funds to her before the Plunge. She created an online fundraising page for herself and one for the ISP team on the Polar Plunge website. The pages generate a great deal of funds for her teams. On the day of the Plunge, Vanderkooy talks to the Knights of Columbus who help plan the Plunge and asks for donations. “I have established a wonderful relationship with so many Knights who have the biggest hearts for Special Olympics and are always happy to help if you just ask them,” says Vanderkooy. Her advice to warm up after the Plunge is to “change into dry clothes very quickly with some warm socks!” After warming up, Vanderkooy attends the post-Plunge Party that includes a great band where attendees can dance with friends, family and athletes. Texas Road House and the Knights have hot food waiting for plungers. She introduces herself to as many people as possible with an athlete to the let the Plungers know who they are plunging for. Vanderkooy will take a picture of the athlete with a plunger in the costume so the plunger can revisit the picture and return the next year. The team will be plunging again this year at noon Saturday, March 5, at Knights of Columbus Hall 4179 on Lake Springfield, Chatham. 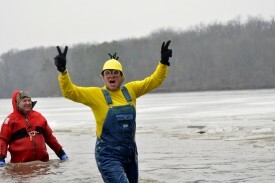 If you are interested in joining “TEAM Illinois State Police” for the Springfield Plunge or want to plunge at any of Illinois’s 21 locations, visit PlungeIllinois.com.